Prentice Hall. Hardcover. 0136020070 New US Edition Textbook, Ships with Emailed Tracking from USA . New. 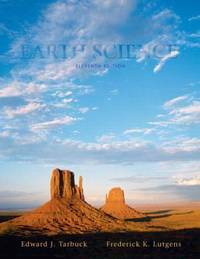 Tasa, Dennis, Tarbuck, Edward J., Lutgens, Frederick K.
Prentice Hall, 2011-01-07. 13. Hardcover. Used:Good. Prentice Hall, 2008-12-04. Paperback. Used:Good. Prentice Hall, 2008-03-07. 12th. Hardcover. Used:Good. Prentice Hall, 2008-12-04. 12. Paperback. Good. Prentice Hall. Hardcover. 0136020070 US Edition Textbook, May Have Highlights, Notes and/or Underlining, BOOK ONLY-NO ACCESS CODE, NO CD, Ships with Emailed Tracking from USA . Good. Pearson College Div. Hardcover. 013197212X New Condition. . New. Prentice Hall. Hardcover. 0131497510 New Condition. . New. Prentice Hall. Hardcover. 0130484563 New Condition. . New. Prentice Hall. Hardcover. 0136020070 New Condition. . New. Prentice Hall, 2005-03-18. 11th. Hardcover. Used:Good. Prentice Hall, 2005-03-18. Hardcover. New. Also includes DVD and Student lecture notebook in shrink wrap. Ships Out Tomorrow! Prentice Hall. Hardcover. 0136020070 12th Edition. Includes CD. Clean text. May have some cover wear. SATISF GNTD + SHIPS W/IN 24 HRS. Sorry, no APO deliveries. Ships in a padded envelope with free tracking. J14C . Good. 2008-03-07. 12th. Prentice Hall. Hardcover. 0130484563 Like New Condition. . Fine. Prentice Hall. Hardcover. 0136020070 Like New Condition. . Fine. Pearson College Div. Hardcover. 013197212X Like New Condition. . Fine. Prentice Hall. Hardcover. 0131497510 Like New Condition. . Fine. Prentice Hall. Hardcover. 0136020070 MULTIPLE COPIES. 12th Edition. Includes CD. Clean text. SATISF GNTD + SHIPS W/IN 24 HRS. Sorry, no APO deliveries. Ships in a padded envelope with free tracking. L10B . Very Good. 2008-03-07. 12th. Prentice Hall, 2011-01-07. Hardcover. Good. Prentice Hall, 2005-03-18. Hardcover. Good. Prentice Hall, 2005-03-18. Hardcover. Acceptable. Ships daily from the sunshine state! [Unopened CD included] Exterior shows significant wear to edges & corners with some stickers, inside has highlighting. Prentice Hall, 2008-03-07. Hardcover. Good. Prentice Hall College Div, 1996-10-01. 8th. Hardcover. Used:Good. Prentice Hall College Div, 2005-03-31. 11. Hardcover. Used:Good. Prentice Hall. Hardcover. 0131497510 Like New Inside and Outside. Clean and crisp pages w/minor highlighting throughout! Includes a CD...Excellent book! ( z1s135C ) Some minor shelf wear on cover especially corners. ** Fast Shipping** . Fine. Prentice Hall College Div, 2005-03-31. Hardcover. Very Good. Pages are clean. Includes Sealed CD! Book Leaves in 1 Business Day or Less! Leaves Same Day if Received by 2 pm EST! Cover has shelf wear. Very Good. Prentice Hall College Div, 1996-10-01. 8th. Hardcover. Very Good. Pages are clean. Book Leaves in 1 Business Day or Less! Leaves Same Day if Received by 2 pm EST! Cover has shelf wear. Very Good. Prentice Hall, 2002-06. Hardcover. Good. Prentice Hall PTR, 2011. Misc. Supplies. Good. Disclaimer:A copy that has been read, but remains in clean condition. All pages are intact, and the cover is intact. The spine may show signs of wear. Pages can include limited notes and highlighting, and the copy can include previous owner inscriptions. Prentice Hall, 2005-03-18. Hardcover. Used: Good. Prentice Hall. Used - Good. Good condition. 11th edition. Highlighting inside.Writing inside. Pearson College Div, 2005-03-31. Hardcover. Acceptable. All books ship SAME or NEXT business day!! 2nd Day Shipping Available! Great buy on a reading copy with significant cosmetic wear to covers, pages, and binding. Book may suffer some shelf wear, may include notes and highlighting. May NOT include supplemental materials, cds, codes, etc. Book has some water damage. Still usable. Contact us with Questions!! Prentice Hall. Used - Acceptable. Shows definite wear, and perhaps considerable marking on inside. Pearson College Div. Hardcover. 013197212X Moderate rippling/discoloration on bottom 25% of all pages due to liquid exposure. All pages are still usable and readable. HARDCOVER. DOES NOT INCLUDE CD. Moderate wear to cover/edges/corners. Cardboard up to a dime size showing on corners. Binding and cover solidly connected. School markings, book numbers, stickers, bar-codes, and names, on/inside book. Some markings/highlighting on/inside book, none of which detracts from content. Black-out marks inside covers of book, a few minor rips to page edges. . Fair. Pearson College Div. Hardcover. 013197212X Mild rippling/discoloration up to 3" into bottom of all pages due to liquid exposure. All pages are still usable and readable. HARDCOVER. DOES NOT INCLUDE CD. Moderate wear to cover/edges/corners. Cardboard up to a dime size showing on corners. Binding and cover solidly connected. School markings, book numbers, stickers, bar-codes, and names, on/inside book. Some markings/highlighting on/inside book, none of which detracts from content. Black-out marks inside covers of book, a few minor rips to page edges. . Fair. Prentice Hall. Hardcover. 0131497510 WE HAVE NUMEROUS COPIES. HARDCOVER. INCLUDES CD. Moderate wear to cover/edges/corners. Cardboard up to a dime size showing on corners. Binding and cover solidly connected. School markings, book numbers, stickers, bar-codes, and names, on/inside book. Some markings/highlighting on/inside book, none of which detracts from content. Black-out marks inside covers of book, a few minor rips to page edges. . Good. Prentice Hall. Hardcover. 0130484563 WE HAVE NUMEROUS COPIES. HARDCOVER. INCLUDES CD. Light to moderate wear to cover/edges/corners. School markings and writing on/inside covers. Minimal markings/highlighting on/inside book, none of which detracts from content. Binding and cover solidly connected. . Very Good. Prentice Hall. Hardcover. 0130484563 WE HAVE NUMEROUS COPIES. HARDCOVER that has been rebound as a SPIRAL BOUND. Heavy wear and creasing to cover/edges/corners. Rips and tears on edges of pages and binding. Cardboard showing on corners, edges and spine of book. Cover solidly attached but may show signs of loosening. Binding still intact and strong, and all pages are present and usable. Black-out marks on edges of pages. School markings/highlighting throughout book, but do not impair usability. . Fair. Prentice Hall, 2002. Hardcover. Acceptable. Disclaimer:A readable copy. All pages are intact, and the cover is intact. Pages can include considerable notes-in pen or highlighter-but the notes cannot obscure the text. At ThriftBooks, our motto is: Read More, Spend Less.Dust jacket quality is not guaranteed. Prentice Hall PTR, 2005. Hardcover. Acceptable. Disclaimer:A readable copy. All pages are intact, and the cover is intact. Pages can include considerable notes-in pen or highlighter-but the notes cannot obscure the text. At ThriftBooks, our motto is: Read More, Spend Less.Dust jacket quality is not guaranteed.